Eighty three officers and men (3 officers and 80 other ranks) died after HMS Tweed was torpedoed. One body was recovered from the sea and together with five survivors who later died from their wounds were buried at sea. 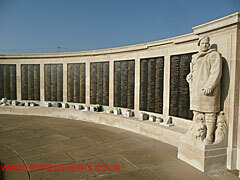 The others were never seen again (virtually all the survivors were injured in the sinking – mentally and physically. For some the effects of the sinking lasted for the rest of their lives). 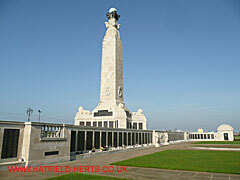 All those who died when HMS Tweed sank and have no grave but the sea are commemorated on the Royal Navy memorial at Portsmouth (shown in the photos). Listed below alphabetically are the names of those men who made the supreme sacrifice (please note: MPK – Missing Presumed Killed; DOW – Died of Wounds). Behind each of the names is a story and a tragedy for the families involved. Of the 83 the age of 65 are known; they ranged from 18 to 47 (36 were 21 or under). 20-year old Edward James Millichope was married. Another 20-year old, Peter Critcher's parents lived in Croxley Green, Hertfordshire. While George Eric Dunell, 25, came from Canada. Please note: there are variations in the crew list supplied by Royal Navy records, the Commonwealth War Graves Commission database, and the Board of Inquiry report. Variations in rank may be due to the Navy list being contemporary to the period of the sinking and those shown as holding temporary and / or acting positions may have received posthumous confirmation of rank. Other variations may be due to inaccurate recording during the war, misspellings, poor handwriting or errors made when transferring the data from paper to an electronic format. Most of these have been resolved however it is possible that there may be others. Age of casualties, where recorded, is listed in brackets.